These watering cans harken back to the good old days spent helping Grandma in the garden. 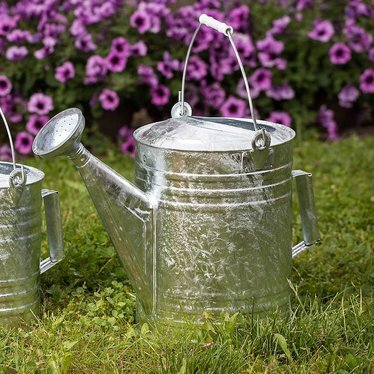 Sturdy construction and a galvanized seamless finish make these watering pails long-lasting and practical for the novice or master gardener. Note: The watering can head is removable, but it is difficult to remove since there is sealant around it to prevent leaking. To remove, the manufacturer recommends that you place it in a vise and twist it off with pliers. What did I like ?? Everything. This is a serious utility highly functional watering can. The heavy duty one piece spout is strong and functional. All of the other ones have tiny little decorative spout stabilizing braces which wont hold up to much abuse. Fully galvanized for a long rust resistant life...probably will out live you unless you run it over with your tractor. Comes in 3 sizes for your specific needs. Don't waste a single penny on the plastic ones because they will be broken in one season...the plastic ones are essentially disposable junk. Not only is this the best but the most reasonably priced. You can get a more 'decorative' one but if that's important just buy this and decorate it to your own desires. This reasonably qualifies as a lifetime product. The last one you'll ever have to buy unless you need more than one.